100 Prophecies fulfilled by Jesus speaks to the very heart of the hope found in Christ, the Messiah. It's amazing to discover that Jesus fulfilled more than 100 prophecies foretold 400-1500 years before his birth. This booklet arranges prophecies into those related to Jesus' birth, life, ministry, death, and resurrection. 100 Prophecies fulfilled by Jesus is organized in a helpful format that presents the prophecy, alongside the Old Testament reference, and the New Testament fulfillment and Scripture reference. The prophecies are divided into those regarding "Jesus' Birth," "Jesus' Life and Ministry," and "Jesus' Death and Resurrection." Also included are the "Jesus' Titles and Attributes" mentioned in both Old and New Testaments. 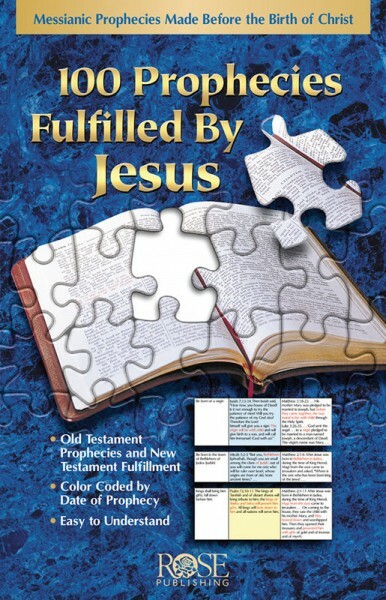 The booklet makes an excellent Bible study or reference tool and equips teachers to share the amazing story of the Old Testament's promise of the Messiah's coming and the glorious New Testament fulfillment of those promises.